The older you get, the more you realize that much of the excitement that surrounds the holiday season is based on nostalgia — that warm, fuzzy feeling that calls to mind the Christmases of our childhood as last-minute shopping, family bickering and cringe-inducing travel days threaten to shrink our hearts three sizes too small. It’s that Yuletide wistfulness that made my Christmas night unboxing of the 2013 Masters of the Universe Classics Castle Grayskull a welcome, cathartic experience that brought me back to one of my earliest Christmases. It was nearly three decades ago that I found He-Man’s imposing fortress under my parents’ Christmas tree, and might actually be one of my first Christmas morning memories. Now, standing on the precipice of 30, I freed Grayskull from its cardboard confines, momentarily casting aside my concerns that A) This this is going to be a nightmare to store and B) I destroyed its resale value. But, I mean, look at this thing. Far from a mere recreation of the 1980s cornerstone of Mattel’s Masters of the Universe collection, this thing has been rebuilt from the ground up, maintaining the overall look and spirit of the original playset while making it bigger, better and more detailed. This is Castle Grayskull as we remember it — not necessarily as it really was. From the opening “Jawbridge” to the working elevator to the “trap door” in front of the throne, this new Castle Grayskull hits all the right notes, and even includes some added features that weren’t present in the original including a jail cell (with real chains! ), secret doors and an additional third-floor ledge so you can stage epic battles in your displays. I am almost 30, right? 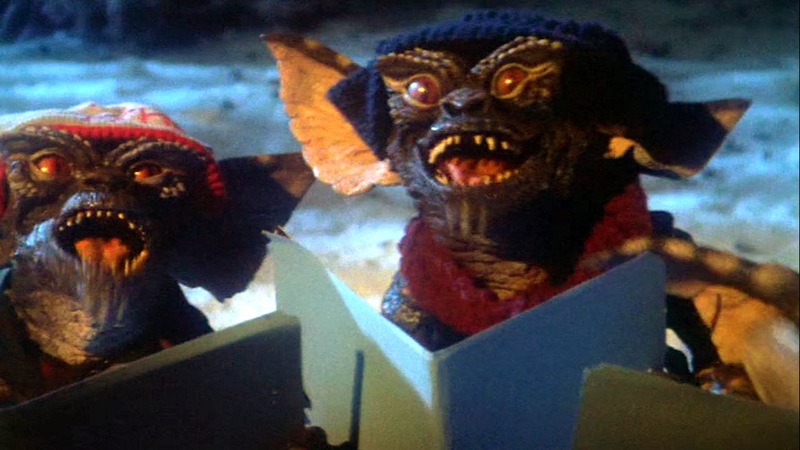 Merry Christmas, Wortmaniacs! If you’re like me, the holidays just aren’t complete without watching some classic Yuletide films. National Lampoon’s Christmas Vacation, A Christmas Story, Home Alone, The Nightmare Before Christmas, Scrooged, Bad Santa and Elf are required yearly viewing as far as I’m concerned, but many of the best Christmas flicks out there aren’t directly related to the holiday at all. Grab a glass of eggnog and peruse this handy (and non-paginated) list of my favorite Christmas movies that aren’t technically Christmas movies. John Landis’ Trading Places, the story of a commodities broker (Dan Aykroyd) and a homeless man (Eddie Murphy) switching lives as part of a bet/social experiment, is a film that always makes me nostalgic for a time when Eddie Murphy was one of the funniest comedians around. The film takes place from Thanksgiving to New Year’s, and might be the only time we’ll ever get to see a Santa suit-clad Dan Aykroyd eating salmon on a bus. Leave it to ol’ Sly Stallone to cram the Cold War, Kenny Loggins, and a robot that sings “Happy Birthday” into an uber-patriotic Christmas package that’s worth opening early. Although Christmas has been a part of the Rocky series from the beginning, this film pitted the titular Italian Stallion against Ivan Drago (Dolph Lundgren) in Russia on Christmas Day. By defeating Drago and garnering respect from America’s enemies, Rocky Balboa taught us all how to love. And isn’t that what the holidays are all about? Guys? Hello? Between Lee Bermejo’s Batman: Noël, the Christmas setting of the Arkham Origins video game and just about everything in Tim Burton’s Batman Returns, The Dark Knight just might be a bigger Christmas icon than Frosty the Snowman. This 1992 sequel to Burton’s Batman kicks off with a villainous attack during a Gotham City tree-lighting and ends with The Penguin (Danny DeVito) hatching a twisted Christmas Eve plan to abduct and drown children. ‘Tis the season, amirite? But most importantly, Batman Returns taught us one of the most important lessons of the season: No matter how delicious it looks, don’t eat mistletoe. It’ll probably kill you. Office Christmas parties tend to get out of hand, but there’s usually a lot less shooting and explosions involved. John McTiernan’s classic Die Hard pits grizzled New York cop John McClane (Bruce Willis) against terrorists in a Los Angeles skyscraper on Christmas Eve. There’s little about the premise that screams “Santa,” but the film’s constant holiday allusions makes it a must-watch when the weather outside is frightful. Christmas served as the backdrop for Joe Dante’s too-terrifying-for-children tale of a furry (and toyetic) holiday pet that spawns legions of mischievous monsters that terrorize a Norman Rockwell-esque small town. The chaos caused by these demonic green abominations is not all that dissimilar to what one might find at Target during the holidays, but at least no one in the film runs the risk of having their credit card information stolen. Zing! The Warp Zone has transformed the “Misty Mountains” song from The Hobbit: An Unexpected Journey into a pretty fun rap video, and I discovered it at the right time. I’ve had Mariah Carey’s “All I Want for Christmas” stuck in my head for the last three days, and this new earworm has subdued my urge to knock myself unconscious with the nearest Yule Log. It’s a Christmas miracle! Watch Thorin Oakenshield, Bilbo Baggins, Legolas and Gandalf spit rhymes below and, if you haven’t already, check out my review of The Hobbit: The Desolation of Smaug by clicking here. Bloated, overwrought and needlessly busy, The Hobbit: The Desolation of Smaug provides 161 minutes of additional proof that Peter Jackson is in dire need of more discerning editor. Though far more entertaining than An Unexpected Journey — the first installment of the film trilogy based on J.R.R. Tolkien’s landmark children’s tome — Smaug often buckles under its own ambitions, deluded into thinking that bigger is always better. Much like Bilbo Baggins himself in his later years, this film feels like “butter scraped over too much bread,” and it ultimately isn’t all that appetizing. 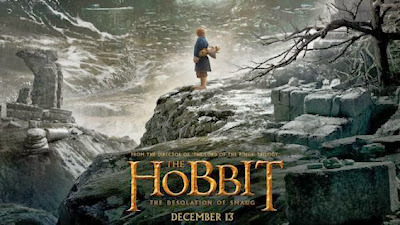 The Desolation of Smaug picks up shortly after the conclusion of the previous film, with Bilbo — played spectacularly by Martin Freeman — accompanying a group of Dwarves led by Thorin Oakenshield (Richard Armitage) to the lost Dwarf city of Erebor, where the titular dragon slumbers. But before they contend with that fire-breathing menace, the group encounters spiders, Elf warriors and legions of snarling Orcs. As the Dwarves fight to reclaim their home under the Lonely Mountain, Gandalf (Sir Ian McKellan) is drawn to the East, where an ancient and malevolent force threatens all of Middle-earth. Since The Hobbit is a relatively brief novel compared to the sprawling Lord of the Rings epic, some padding was necessary for Jackson to craft what amounts to nine-hours of screen time. As such, Smaug introduces characters and situations that were not part of Tolkien’s original story. Orlando Bloom reprises his role as Legolas, a character who did not interact with Bilbo & Co. in the original story, while Lost star Evangeline Lily plays Tauriel, a a Mirkwood Elf created solely for the movie adaptation. Purists might balk at Tauriel’s inclusion in this version of the story, but she brings to the film a welcome female presence. Her romance with Kili the Dwarf (Aiden Turner) is a bit forced, but it’s also a welcome emotional hook in a film that has a tendency to devolve into a non-interactive video game cutscene. Indeed, there’s far more action in this outing than its predecessor but, much like the first film’s ludicrous chase through Goblin-town, most of the battle sequences come dangerously close to being goofy. In fact, it never even appears as though any of the heroic characters are in danger during even the most harrowing scenes. When your protagonists are effortlessly fending off legions of CGI monsters while simultaneously defying the laws of physics, even the most dazzling of set pieces can become a chore to sit through … even in 3D. Despite its flaws, The Desolation of Smaug isn’t a total disappointment. Smaug (voiced by Benedict Cumberbatch) is a technical marvel, and there are several moments in the film that remind us why we first fell in love with Jackson’s vision of Middle-earth twelve years ago. However, as both an adaptation of a beloved classic and as a prequel trilogy to The Lord of the Rings, The Hobbit seems to be falling short thus far. Let’s hope for redemption when There and Back Again hits theaters next year. According to casting details on tvshowauditions.info, Fox’s forthcoming Gotham television series will feature a 10-year-old Bruce Wayne as a regular, all but confirming suspicions that the Batman-themed series will not feature The Caped Crusader himself and will be set years before Bruce dons the iconic cape and cowl. So, in essence, this will be a police procedural starring a young Jim Gordon ridding Gotham’s streets of … well … generic thugs. In most versions of the lore, it’s Batman’s presence that inspires the city’s most psychologically depraved criminals to develop a “taste for the theatrical” and become the iconic Rogue’s Gallery we all know and love. So unless this show deviates dramatically from canon, we shouldn’t expect appearances by Mr. Freeze, Killer Croc, Clayface, The Joker, The Riddler or even Clock King. Without Batman or his colorful assortment of adversaries, why exactly should we watch this show again? At least with Marvel’s Agents of S.H.I.E.L.D., there’s always a chance Iron Man or Bruce Banner could drop by and say hello to the series regulars. It’s slim, but it’s there. You knew it was coming. More than one year after Disney acquired Lucasfilm Ltd. and revealed plans to continue George Lucas’ Star Wars saga, The House of Mouse has secured the rights to market and distribute future films in the Indiana Jones series. 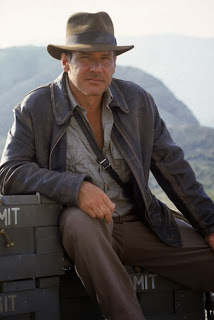 Deadline.com reports that the original studio, Paramount Pictures, retains the rights to the original four Indiana Jones films, and will also be entitled to “financial rewards” for any future Indy flicks produced by Disney. The big question is, does this mean Disney is actually interested in more sequels after Indiana Jones and the Kingdom of the Crystal Skull was savaged by critics and reviled by fans? Personally, I’d love to see Indiana Jones in an animated series of films, sparing us the indignity of seeing “tough guy” Shia LaBeouf in Mutt Williams and the Lost Opportunity. X-Men: Days of Future Past hits theaters next summer, but director Bryan Singer is already hinting at where he’ll take Marvel’s mutants in the next installment of the franchise. Whether or not this means we’re getting some sort of “Age of Apocalypse” adaptation in 2016, it’s clear we’re finally going to see Hugh Jackman’s Wolverine and the rest of the movie-verse X-Men tangle with one of their greatest, nigh-invincible nemeses. Who will play the everliving mutant adversary? Let the speculation commence! Remember how Spider-Man 3 mucked up the blockbuster Marvel franchise so badly that Sony needed to reboot the series entirely just 10 years after it began? Most folks attribute Sam Raimi’s baffling narrative misstep to the film’s surplus of supervillains, forcing Sandman, Green Goblin II (or “New Goblin”) and Venom into a single, overwrought story due to studio mandates. It didn’t work, making it all the more refreshing when Marc Webb’s 2012 reboot, The Amazing Spider-Man, stuck with one baddie — The Lizard — and helped us all forget that Spider-Man 3 had more scenes featuring Tobey Maguire’s scrunched-up boo boo face than genuine superheroic spectacle. Now, Sony is preparing to unleash The Amazing Spider-Man 2 upon the moviegoing populace next summer, putting Andrew Garfield back in the tights as Peter Parker uncovers new truths about his parents’ mysterious past while furthering his relationship with doomed high school sweetheart Gwen Stacy (Emma Stone). Oh, and he also has to deal with Electro (Jamie Foxx), The Rhino (Paul Giamatti) and an already-evil Harry Osborn (Dane DeHaan). So yeah, we’re back with three villains … because that worked so well for these movies last time. Skepticism aside, this movie looks pretty damned entertaining, and I’m looking forward to seeing where Webb takes the story this time around. This series is clearly borrowing a great deal from Brian Michael Bendis’ Ultimate Spider-Man, which is what got me back into comics in a major way in the early 2000s. There’s promise here, let’s just hope Sony’s learned from their previous mistakes. Check out the first official trailer for The Amazing Spider-Man 2 below. Just days after DC Comics announced they will be dressing Bane up like Batman because they’ve seemingly lost their minds, I finished up Batman: Arkham Origins, a title that might be one of the last great video games of the current console generation. It features the same game mechanics that made me obsessed with Arkham Asylum and Arkham Origins — both of which cemented The Caped Crusader as a bonafide video game star — and it has enough replay value to keep me hooked on side missions and repeat playthroughs for the foreseeable future. New developer Warner Bros. Games Montréal ably steps in for the franchise’s previous developer Rocksteady Studios, crafting a Batman story that puts us into Bruce Wayne’s boots just two years into his career as Batman. The Dark Knight, at this point in the chronology, is viewed as a pseudo-myth by the populace of Gotham City, while the police force has yet to realize that Batman is their greatest ally in the fight against crime. The entirety of the game takes place on Christmas Eve, when The Black Mask has placed a bounty on Batman’s head, drawing eight of the world’s most deadly assassins to Gotham City (including Bane, dressed appropriately). To keep these mercenaries from causing untold havoc on the city to draw him out, Batman instead takes the fight to them. Of course, through some twists and turns that I won’t spoil here, Batman ultimately finds himself face to makeup-smeared face with one of his most iconic adversaries for an epic series of confrontations that are no joke. Okay, maybe they are. Because it’s The Joker. Although if that’s really a spoiler for you at this point, you probably deserve the heartbreak. 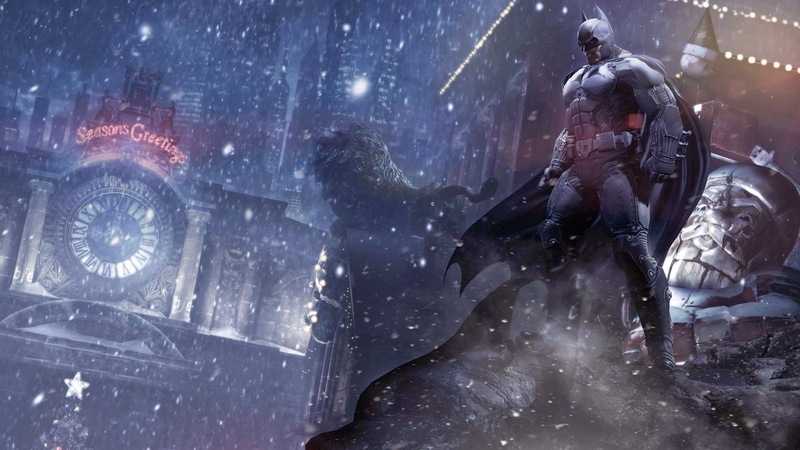 Aside from the yuletide setting that instantly reminded me of Tim Burton’s Batman Returns (one of my childhood favorites), I also really appreciated that Arkham Origins puts us in control of a Caped Crusader that doesn’t have all of the answers just yet. 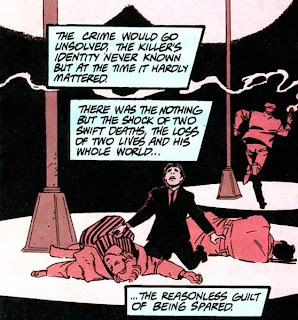 He makes mistakes, and has yet to earn the title of “The World’s Greatest Detective.” This portrayal of the character is far more interesting than his treatment in recent comics like Justice League, in which Batman is perceived as the most powerful guy in the room even when he’s sitting next to Superman. The Dark Knight’s humanity in the midst of chaos makes him interesting, and it’s always cool to see that brought to the surface whether it’s in comics, film, animation or, yes, video games. Judging by Arkham Origins’ ending, this franchise can go in any number of directions — some of which might not even necessarily involve Batman — and I can’t wait to see what lies ahead. Even though my life doesn’t afford me much time for video games these days, this is one series that is consistently worth the investment.